DrinkWire is Liquor.com's showcase for the best articles, recipe and reviews from the web's top writers and bloggers. In this post, Drizly offers a brief history of Punch. The punch culture isn’t a new fad, it’s actually been around for centuries. It has a rich and robust history dating all the way back to the early seventeenth century, when sailors from India brought the first batch over to England. From there, it sparked interest throughout Europe. The recipe changed here and there over the course of a few centuries, but punch’s core formula contains five ingredients (fun fact: the word “punch” does derive from the Indian word for “five”). The originals being: alcohol, sugar, water, lemon, and tea or spices. 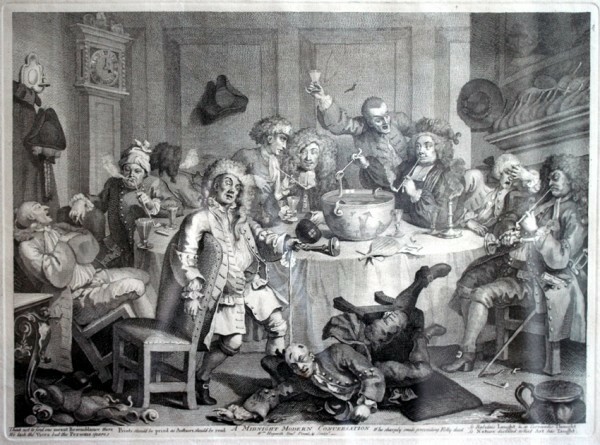 It’s safe to say cocktail culture has come a long way since the seventeenth century but even the core ingredients in our modern day punches haven't changed all that much. Punch culture was built off of this idea that you could combine easy-to-find ingredients, add in alcohol and have a large batch to serve to the masses. It can be low in alcohol, or even served sans alcohol but it is always expected to taste like a fusion of fruit. Looking at different punches today, there are a few signature varieties. We laid out the most popular options, along with a few of our favorite picks. The original punches were made with wine or brandy, until Jamaican Rum was introduced and changed the whole game. Thus, the “modern” punch era was born. We now consider Rum Punch to be one of the most common alcoholic punches out there. Some popular rum-based recipes that may ring a bell are Planter’s Punch, Bajan Rum Punch, and Caribbean Rum Punch, all of which contain a varying ratio of rum, bitters and several juices. Rum punches tend to be sweet, and pair well with warm-weather and the beach (duh). If you’re looking for a drink that will transport your tastebuds to paradise, this is probably the one for you. Aside from the popular Rum & Bourbon based punches, every country has their own unique take on the drink as well. For all the winos, punch in Chile is most commonly mixed with white wines, and a variety of fruits with canned peaches. This is a simple mixture that's perfect for serving at a night with friends. The punches in Mexico however take a bit more dangerous approach...with Tequila. The ultimate punch for large gatherings, this recipe includes fermented sugarcane or tequila with a mixture of aguas frescas. This is a combination of fruits, cereals, flowers and seeds which basically make this punch incredibly sweet, and difficult to taste the alcohol. But if you're up for a real challenge, give Germany's version a taste. This punch kicks it up one more level with a mixture of red wine and flaming rum. This drink is literally referred to as the "Fire Tongues Bowl", so you can see why it peaked our interest. Mix the two main ingredients with several fruit juices or spices of your choice and you're ready to roll.